In the 19th century it was common for authorities to make plaster ‘death masks' of an executed criminal's face, to conduct phrenological analysis. 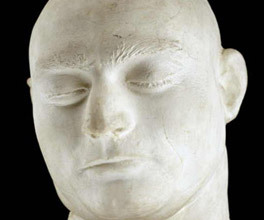 The masks were often put on public display and – not surprisingly – Ned Kelly's death mask was a source of public fascination. Kelly was hanged on 11 November 1880. An hour after his death, his hair and beard were shaved, and plaster was applied to his face and head to make a death mask. The next day, the mask was on public display in Bourke Street, along with explanations of how the shape of the head and face represented his criminal tendencies. Although the mask was exhibited for scientific purposes, there were other, less obvious reasons for putting it on display. Firstly, it showed the ability of the authorities to deal with the worst criminals. Secondly, people of the 19th century had a particular fascination with bushrangers, so it had entertainment value for the public. Before Kelly's execution, A.S. Hamilton – a self-proclaimed ‘Professor of Phrenology' – saw the money-making potential of reading Kelly's skull and applied for permission to analyse the head before execution. His request was denied, but he later assisted the craftsman appointed to make the death mask and made some measurements of Kelly's skull. ...there are few heads amongst the worst that would risk so much for power as is evinced in the head of Kelly from his enormous self-esteem. This self-esteem, combined with large love of approbation combined with hope, would often make him appear bright, dazzling and heroic to those who could not see through the veil that vanity threw around him. The science of phrenology was boosted by Hamilton's reading, as well as by the huge public interest in the Kelly story. Public curiosity lent credibility to the interpretation and Ned Kelly's head maintained its place as an object of science, as well as a symbol of state power. Ned Kelly's suit of armour is one of Victoria's most treasured and symbolic historical icons. With a brutal criminal past, Mark 'Chopper' Read has turned his jail sentence into a successful money-spinner. It's no surprise that wild Ellen Kelly was the mother of Australia's most famous bushranger, Ned Kelly.